Adam Lambert Talks Miami Festival, About the Break Up and His Advice on What to Say To Him When You Meet Him! You are here: Home / More Featured Posts / Adam Lambert Talks Miami Festival, About the Break Up and His Advice on What to Say To Him When You Meet Him! This has been a sad week in Lambertville. Many of @adamlambert’s fans were truly surprised and saddened to hear of Adam’s break up with 2-year love, Sauli Koskinen. We’ve read all the articles giving the same quotes about how their relationship was “on its way out in the last couple of months” and how they’re still really good friends, and he even “gave him a coffee and bagel earlier today.” Did you see the mini-tweetversation about this between Adam and his Dad yesterday? @adamlambert ah. I was wondering what the “a coffee and bagel” euphemism meant but was afraid to ask. @milestougeaux wasn’t a euphemism! Lol. But there is some good news in all of this. I’ve come across the original article by Jason Parsley from SouthFloridaGayNews.com (thanks @LambertLust for the nudge!) which led to finding a brand new piece from the same source. This additional piece is full of new tidbits that will bring a smile to your face. Here’s a few, and then if you want to read the rest (and who wouldn’t!) click the link at the end! You said before you went on tour with Queen you were nervous. I was totally intimidated and excited all at the same time. The first show we did was in the Ukraine and there were 250,000 people in the audience. That’s the biggest live audience that I ever performed in front of so lots of butterflies in my tummy. Any more plans to tour or sing with them? I don’t know. We left it kind of open. We had such a good time and really connected. And it felt really good to all of us. I’m sure in the future there will be something. But I don’t know what or when. What’s up with all the Straight girls that love you? I think I notice more female fans than male fans in general, which is great. I love it. But I would love a little more of a mix at my concerts. But I think Miami will give us a little more of that. But I really like performing for people that connect with the music and that’s the bottom line. So I don’t discriminate. I love women, straight women, gay women, straight and gay men. I love anybody in the audience that wants to have a good time. I was in New York and I was doing a concert there with Cyndi Lauper. This was after the show. There were some fans waiting outside behind the barricades. I was walking out towards the car and the security was ushering me towards it and the doors open. Right before I get to the car this woman really stealthily creeps into the car and sits in the passenger seat. She doesn’t even look at me, she just looks ahead, like “if I don’t look at him he won’t see me” [laughs]. I get into the car and I’m like “wait, who are you?” [laughs] And security comes to the other side really quick and says ‘ma’am you have to get out of the car please.’ And she just sits there again staring straight ahead and not saying anything as if they’re not going to see her if she doesn’t say anything. It was hilarious [chuckles]. She was going for it. 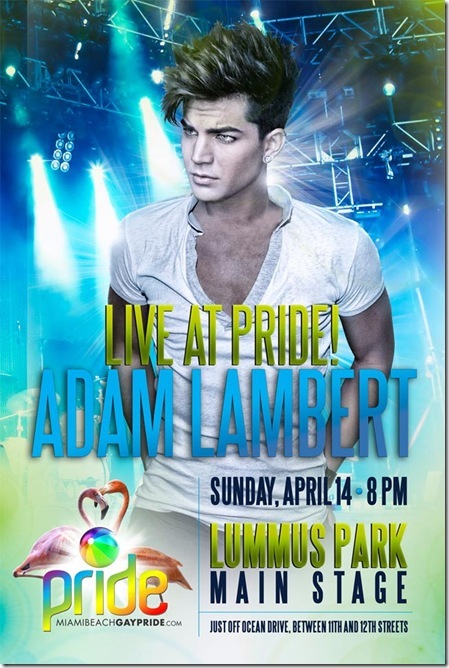 And just in case you get to meet Adam . . .